Judging from the featured photo above you probably wouldn’t believe me if I were to tell you that these are ekokitake mushrooms, the exact same species as can be found in a wide variety of traditional east Asian dishes. However, I am most certainly not in any position here as an educator of sorts to be misleading anyone, especially when it comes to wild mushrooms, as there is a very good reason for that. 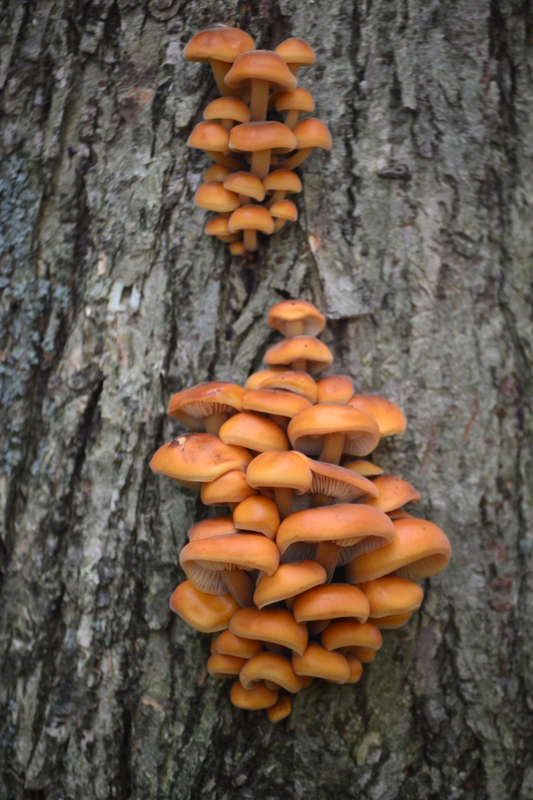 The above photo depicts that average habit of wild enokitake and not the cultivated form. Allow me to explain.. The enokitake (often shortened to just enoki) mushrooms that you can purchase in stores and find in your soup on occasion are the cultivated form of the wild enokitake which still exists throughout the north temperate world and can be found inhabiting both living or dead hardwood. Cultivated enoki are often grown indoors under very sterile and controlled conditions as well as in total darkness, these factors having greatly modified the fungus’ appearance and growth a form with minute caps and long, stringy stems. Enokitake is a saprophytic fungi, meaning that the mycelium (body of the fungus) lives within living and dead wood, degrading the lignin and cellulose which comprise the basic structure of wood. The fruiting bodies often form in tight, congested clusters with the stems emerging horizontally to the ground and curling upwards so that their gills under the cap face downwards. The caps themselves have a slick/slimy texture when wet or very fresh and often overlap each other amongst the congested mass of other individual caps. The base of the stems have a soft, almost woolen texture and are conspicuously darker than the upper portion of the stem. This characteristic has inspired the name ‘velvet foot’, which is a common name of F. velutipes in North America. Another fairly common name, ‘winter mushroom’, points out that this species most often fruits in colder seasons, specifically mid-late autumn (late September – early October in southern Ontario) or even early winter in some more southern locations. This wild species of enokitake is just as edible as the cultivated variety and, in my humble opinion, has a much richer and distinctive flavor. I discovered four separate clusters of these mushrooms fruiting about four or five feet above ground through the bark of a dead elm (Ulmus americana) tree in the county forest behind the farm early last week. I enjoyed them with my farm family in a simple egg drop miso soup with leeks, ginger and garlic. The mushrooms themselves added a wonderful viscosity to the soup and developed a texture similar to squid, a must for any seafood lover gone vegetarian, ordinary seafood lover or just about anyone really. There is however at least one cautionary principal that ought to be excercized when on the hunt for Flammulina veutipes: that being it’s similarity to a deadly poisonous mushroom species by the name of Gallerina autumnal. There are more than enough articles out there already on how to differentiate this fatal species from the succulent delicacy of enokitake, including this one from Tom Volk’s Fungus of the Month and Mushroom Expert. I highly recommend you conduct a thorough investigation as to what you need to look out for in order to confidently identify both Gallerina autumnale and Flammulina velutipes before you go out hunting and/or cooking.